Originally I wasn't going to check this cereal out, because I figured it was just Cinnamon Toast Crunch without the cinnamon, but my fellow foodies over at Junk Banter gave it a glowing review, and we tend to have similar tastes, so I decided to check it out before this seasonal treat disappeared. Then I let it sit in my to-be-reviewed pile for a few months, but now it's finally time to see what all the fuss is about. 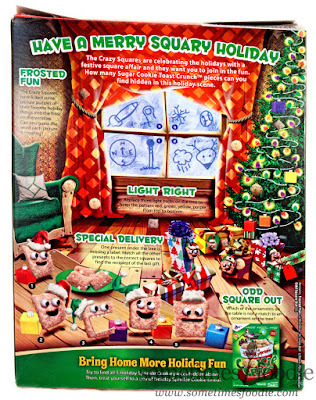 The box design has a simple front, featuring a cartoon stocking filled with anthropomorphized cereal critters, but turn this thing over and there is a LOT going on in the back. (Dare I say, this box is business in the front but a party in the back? datedphraseisdated) The back panel is visually busy, but you know what? I like it! As a kid I would always read the backs of cereal boxes while I got ready for school, and after a day or two (at the most) you're bored! With this package, even if you do all the little brain teasers listed on this box, there's still so much to look at! 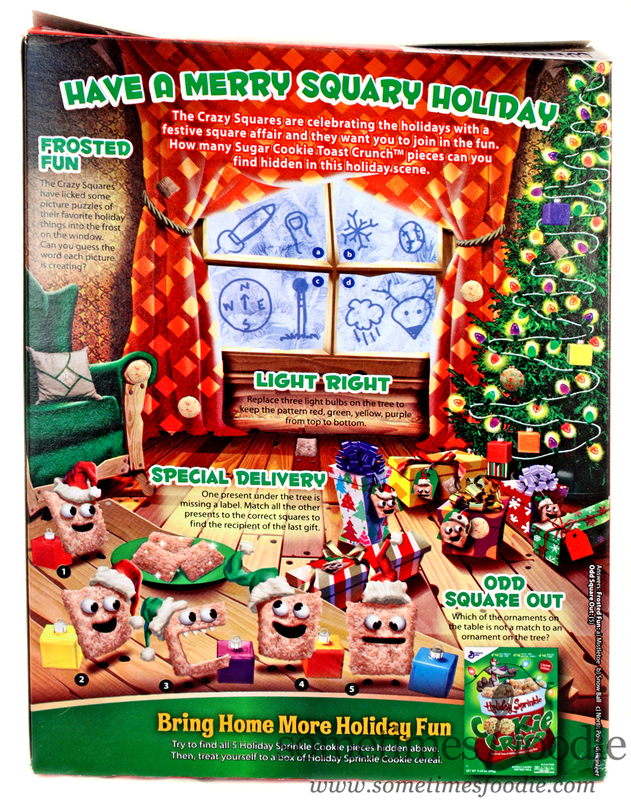 Wacky cereal faces, tree ornaments, you can even count all the light bulbs. I'm an adult and I actually found this to be pretty stimulating, why don't more grown-up cereals do something like this? Like post cryptograms, or sudoku puzzles or something on the back? As far as seasonal cereals go, this box isn't too shabby, and I like it quite a bit. Plus, even with all the sugar, it doesn't seem all that bad for you. Seems pretty awesome so far. I'm an avid proponent that all Toast Crunch cereals taste best when eaten right out of the box, dry, and this is no exception. 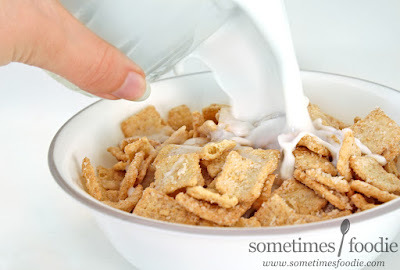 Sure, that sweetened cereal-y milk that's left in the bowl is really delicious and popular (so popular that fancy high-end restaurants are selling "cereal milk" flavored products) but I feel like eating this cereal as intended washes all the flavor away. The milk at the end tastes awesome, but all the cereal bits taste bland and they get soggy pretty quickly. When eaten dry, this cereal is sweet, sugary, and vanilla'd, just like a tube of Pillsbury Sugar Cookie dough from the grocery store! 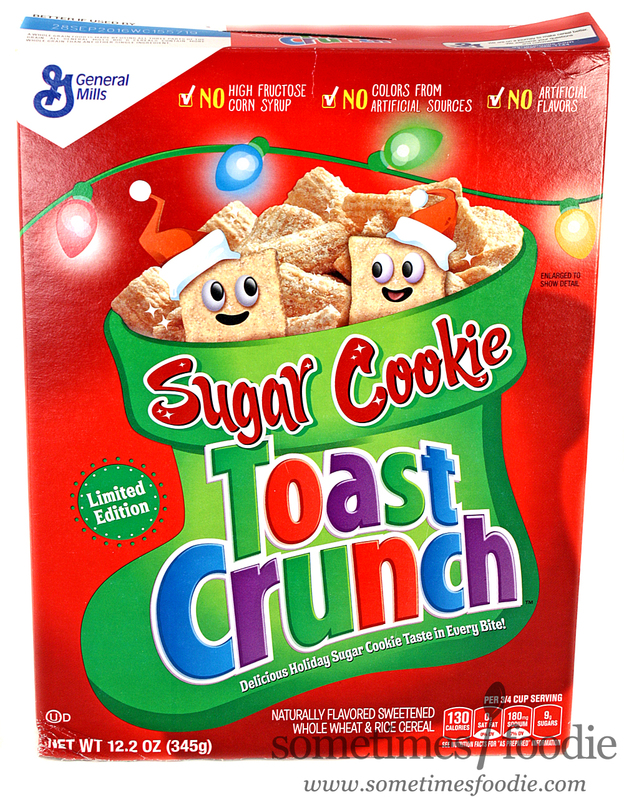 The granulated coating and crispy cereal crunch help to recreate a fairly authentic sugar cookie experience, which is pretty impressive, and very snackable, although I'm not 100% certain that this isn't Cinnamon Toast Crunch without the cinnamon. Even if it is, it's really yummy, and this would be a great breakfast option for cinnamon haters. With milk, the experience changes quite a bit. (Check out this awesome milk-pour shot! I am getting way better at this! I'm super proud.) When I added milk it looked nice, but as always the cereal gets soggy quickly and all of that sugary vanilla flavoring gets washed away. At this point the cereal itself tastes pretty bland, but the milk tastes really sweet and vanilla heavy, kind of like vanilla almond milk, or a very very thinned out vanilla milk shake. 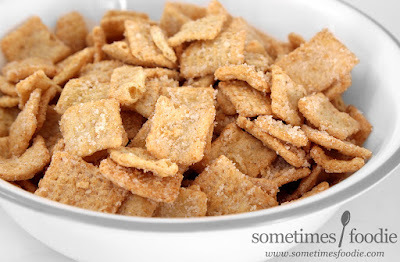 It's still good, and I am sure plenty of people love eating it this way, but I miss the crispy texture of the cereal and the granulated sugar bits. Junk Banter didn't steer me wrong, this is a really awesome seasonal cereal, and I liked it a lot, but I personally prefer it dry right out of the box. I think I saw that they used this as a topping for yogurt or something, and that seems like a really awesome use for this stuff too. I bet it'd be amazing as a topping for ice cream, or frozen yogurt, so you still get all the crunch and sugary goodness, but if you're really really into cereal for the flavored milk left in the bowl, you'll probably really like this stuff too. And I thought the milk-pour shot was incredible BEFORE I realized it was Sugar Cookie Toast Crunch... I'm so glad this didn't disappoint! I had to open another box at work as I read your review. Good thing I still have seven more. Though I liked the taste in milk as well, I concur that dry is the safer bet. I don't use much milk at all, and I just devoured it so quickly that it never had a chance to get soggy. Great review as always, and thanks for some morning nostalgia! These got replaced with Cinnamon Star Crunch this year, they are just not the same! If you dont know what extreme big boom boom is it's my way to say "Bad news" or "Oh no!"